There are a lot of posts to catch up on including the tank and panels, but today was the first run of a few miles to shake things down and get some gas in the tank. It has been so long that I absolutely forgot the joy of riding this bike. The engine and performance are an ideal combination for around town and around the farm roads. Today was just a short trip to see what needs attention and adjustment. It now has a full tank of premium, but more importantly it ran fine once warmed up and is ready for the next concentric circle. If you ever watch those rebuild/restoration shows on TV and watch the auction shows as well, you can be mystified by the astronomical prices for the machines. I often find myself saying things like "But it is still a Honda CB750" or "How can they sell it for that much and still claim to have made nothing?". Well, there are moments in my own humble garage working on my own stuff with no commercial ambitions, that I understand why. Case in point, the tail light that is now on the CB360. I did not want to stick with the horrendous appendage that is the factory tail light. that much was clear. I looked around on the web, and there were plenty of affordable aftermarket solutions including nice small LED options. Although effortless, none of them seemed quite right to me. 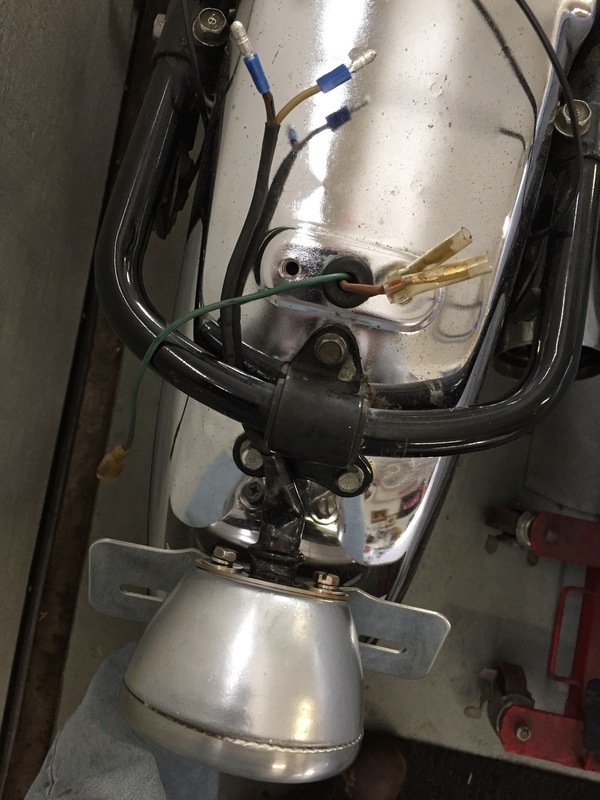 I had used a trailer light on my former R75 Cafe Racer, and somehow that worked. but not here. I looked at a light that I brought back from Beaulieu, but that was not quite right either. Finally, at a local swap meet, I found it. $5 and I have no idea what the original application was, but this was it.